Goods imported into India attract Customs duty … often we read in newspapers of international smuggling racket and seizure of equipments worth crores being brought into the country clandestinely. This is harmful for the Nation as tax is evaded and more importantly, something harmful for the Nation could also be landing ……… sometime back there was news quoting European Food Safety Authority that food containing tainted milk powder from China could be circulating in Europe, potentially putting children at risk. European Union had taken measures to testing all imported products containing more than 15 percent milk powder. In China, milk products contaminated with the industrial chemical melamine have sickened thousands of young children and created a spiraling government scandal. Back home, Deepavali ‘the festival of lights’ is always enchanting – an occasion to wear new clothes, eat sweets, burst crackers, be with friends and relatives – a festivity which brings enjoyment…. – the festival was grandly celebrated all over the country. One might hear that ‘enthusiasm towards fireworks is going down; spiralling prices have forced people to buy less of firecrackers; the pollution awareness is swaying public away from crackers and the like……….’ – at Triplicane, every year Sri Parthasarathi Swami purappadu in the mada veethis takes almost 4 hours from 6 pm – ‘hundreds of 10000 walahs and beautiful fire works lit the air’ as people celebrated Deepavali. 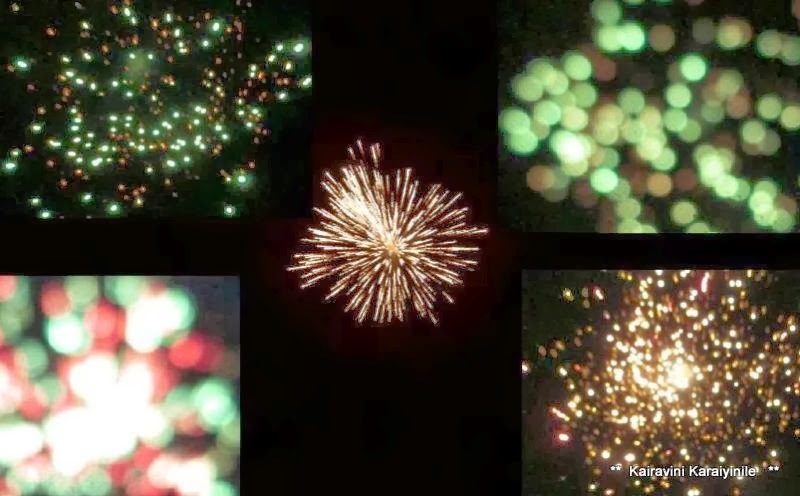 Fire crackers – the small explosives designed to produce noise and the eye-capturing fireworks – both on the ground and on the air have captivated people for centuries now. Every year you get to hear newer names – new introductions say AK47, Break dance, Golden Bonanza, Mumbai Indians, Oh Calcutta are some of the names quoted in the circles as latest wonders, last year ……… the year 2013 – saw some fancy names like ‘super sonica; Chandni ka chand; soneri rath;soneri barsath; floral fantasy… in Chennai, the Island ground bustled with activity now…. ‘Island’ in Chennai ? ~ there are no flowing rivers in the city as milling crowds made beeline to buy crackers of various hues. Sivakasi, in Virudhunagar District of Tamilnadu is the undisputed capital of India’s firecracker industry with about 8,000 factories, big and small, producing 90 percent of the total fireworks output. Hailed as ‘kutti Japan’ – this place is also known for litho printing press and calendars. In this background, read this report that appeared in Times of India, Chennai edition recently…. The Madurai bench of the Madras high court chided top central agencies, including the Customs department, for failing to prevent illegal import of Chinese firecrackers into the country . The court was informed about serious lapses in checking the entry of firecrackers at ports, thus helping their illegal entry. The court was informed that nearly 40 to 50% of containers at Tuticorin port were cleared without opening them for examination. At a special sitting of the bench on Sunday , the customs department (Tuticorin) informed the court that it was not aware of communications sent by the chief controller of explosives (CCE) seeking action against illegal import of Chinese firecrackers to save the Sivakasi-based fireworks industry. The court was considering a public interest litigation (PIL) filed by A Muthukrishnan of Sivakasi against illegal import of Chinese firecrackers. The Tamil Nadu Fireworks and Amorces Manufacturers Association (TANFAMA) was also a party to the PIL. The petitioner told the court that the CCE's letter was communicated to customs authorities, and repeated representations to central government agencies were of no avail. Besides, the CBI did not act on the complaint filed by TN fireworks manufacturers. A division bench of Justice N Kirubakaran and Justice S Vaidyanathan raised several questions to the central government's counsels, representing the CBI, Customs and the Directorate of Revenue Intelligence (DRI). “Illegal import has been brought to the notice of central government agencies for years now. What prevented the agencies from taking suo motu action in the issue? What action was taken on the letter sent by the CCE in 2012,“ the court asked. The special bench also enquired if it was possible to check the entire consignment when hundreds of containers land at the Tuticorin port, which the court was told had just one scanner. Piyush Bharadwaj, assist ant commissioner of customs (Tuticorin), said the CCE's letter of May 30, 2012 was not addressed to the central board of excise and customs (CBEC) or to the DRI. The same was also not addressed to either the commissioner of customs (Tuticorin) or to the chief commissioner of customs (preventive), Trichy . This has been widely reported in most newspapers in Tamilnadu. Out from the Court, reports state that a body working for the welfare of workers in the fireworks industry in Sivakasi has announced a reward ranging from Rs 25,000 to Rs 10 lakh to anyone helping to discover imported Chinese firecrackers.